Special Dynamic 18K solid Gold ring heavy weight, made from two bands: the outer ring turns around. 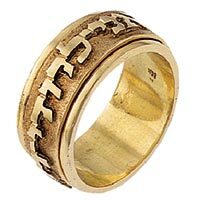 The outer ring is: High polished letters embossed over florentine background Beautiful hand crafted 18K Gold ring made special for you in Jerusalem/ ISRAEL. You choose: any ring size and any phrase.